The title of this post sounds like something that could be written by They Might Be Giants, but alas, it's not. This is a post by an engineer who knows a thing or two about uranium enrichment and I thought I'd flesh out a few scenarios. About a week ago, the IAEA released a new report saying that Iran had greatly stepped up its ability to enrich uranium. The report stated that since November, Iran has tripled its capability to produce uranium enriched to 20%. (Natural uranium has 0.72% U-235, most commercial reactors need 3% to 5% U-235, weapons-grade uranium is around 80% or higher. The arbitrary limit on "low enriched uranium" is set at 20%.) Iran is said to be sitting on a stash of about 105 kilograms of 20% enriched uranium, and is capable of adding about 14 kilograms per month to that stockpile. Additionally, as of 1 year ago, Iran had over 3,000 kilograms of uranium at 3.5% enriched. That's a fair amount of uranium -- especially considering that Iran only has 1 working nuclear reactor (the 5 MW Tehran research reactor), 1 nearing completion (Bushehr), and one a few years off (Arak). 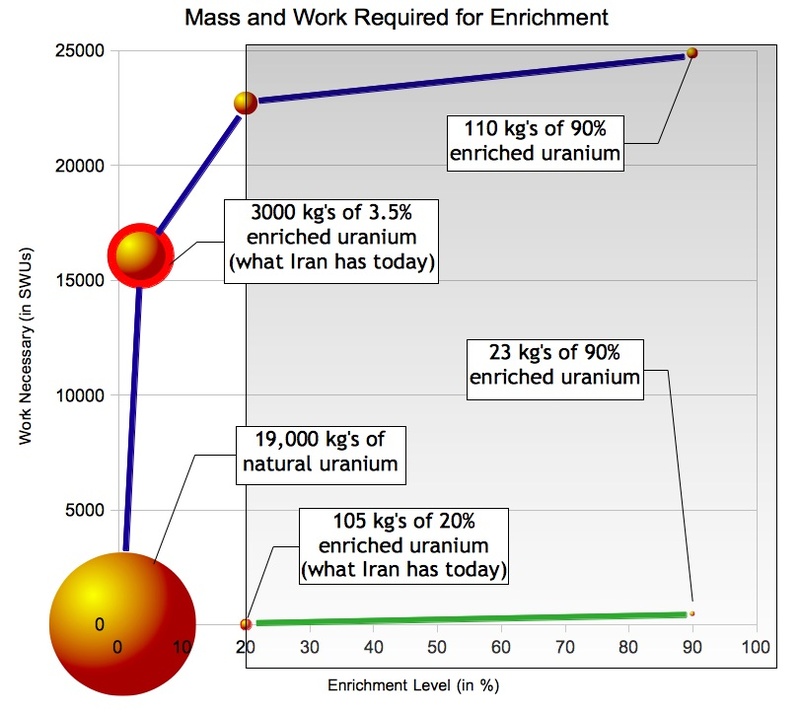 This complicated graph shows three things: enrichment level (on the x-axis), the mass of uranium needed (as shown by the size of the bubbles), and the work necessary to move from one step to the next (as shown on the y-axis). The shaded region (above 20%) is considered Highly Enriched Uranium, and the IAEA and the nuclear Non-Proliferation Treaty (NPT) prevent a country from going above that. The "unit of work" on the y-axis is the Separative Work Unit (SWU). Climbing up the y-axis is really, really hard. There are lots of SWU calculators on the internet that you can use to figure this kind of thing out, but I wrote my own a few years ago to calculate some off-nominal conditions for a project I was working on. For you techno-nerds out there, I assumed a tails of 0.2%. First, look at the blue line. This "path" shows the work and steps necessary to go from natural uranium to 3.5% enriched uranium to 20% enriched uranium to 90% enriched uranium. The red circle at 3.5% enriched uranium is where Iran sits today. Here's the bottom line: as far as separative work is considered, Iran is already two-thirds of the way towards having uranium suitable for a nuclear weapon. Iran also has a stash of 20% enriched uranium lying around. This is shown by the green line. Again, very little work is necessary to turn the 20% enriched into 90% enriched uranium. The approximate quantity of nuclear material in respect of which, taking into account any conversion process involved, the possibility of manufacturing a nuclear explosive device cannot be excluded. For HEU, this is 25 kg. Look again at the above chart at the 90% enrichment level. Yikes. A picture of Iran's installed centrifuges. To be fair, there are a few plausible explanations for Iran's actions. 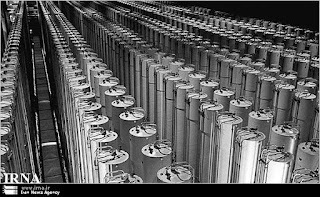 Iran needs 20% enriched fuel for its Tehran Research Reactor, which is also uses to make the medical radionuclide Tc-99m. In fact, with much fanfare, it loaded an Iranian-made fuel element into the reactor a few weeks ago. Having the domestic capability frees them from buying the Tc-99m isotope abroad. Everything Iran has done is in compliance with the NPT, and its enrichment facilities are under the camera surveillance of the IAEA. The Supreme Leader of Iran, Ayatollah, has issued a fatwah against nuclear weapons. The expense (and additional work) needed to get to 20% enriched Just Isn't Worth It. There was a great solution on the table offered to Iran about a year or two ago: "We'll take your 3.5% enriched uranium and trade you the equivalent of 20% enriched." Economically, that would have been fantastic. But Iran turned it down. It is economic folly to go down the path of creating your own front-end domestic fuel cycle when Russia, France, and the US have all independently offered to provide Iran the fuel it needs for the Tehran research reactor, and for Bushehr. Iran, the country, is not sitting on any known large uranium deposits. There is no way that 1 commercial reactor can hope to pay back the expense and effort that went into developing uranium centrifuges and conversion facilities. Leaders (and potential leaders) of countries have been known to flip-flop on key issues before. Call me skeptical. It wouldn't be hard for Iran to kick the IAEA out, shut off the cameras, and devote resources towards making weapons-grade material. Some estimates say that's as little as 2 months out. North Korea did something similar in its push to make plutonium for its weapons. So, the bottom line is that while Iran has been obeying the letter of the law per the IAEA, they're also doing a textbook-perfect case of building nuclear-weapons capability "in plain sight." I made the above chart because I hadn't seen anyone depict this situation graphically before. Hope it helps. It is simply common sense for Iran to build facilities 260 ft under ground. In fact any prudent investor would protect its assets. US has proven to be a a major International law violator as we have seen in the decades after WWII. In fact, Iranians would look foolish around the globe if they simply "trusted" the US/Israel/NATO to respect International law. As for enriching at 20%, Iran has is a signatory to IAEA and has the right to process Uranium up to 20% legally as she wishes. Finally, it must be only a Western "thing" to convict an innocent individual before committing a crime much like the African Americans were subjected to throughout a good part of US history. I further wonder why anyone who legally buys a gun in the US is not automatically convicted of homicide simply based on "suspicion" as you reason for Iran in your concluding remarks? I agree with most of your points. As I stated above, Iran has continued to comply with the IAEA and is allowed per the NPT to enrich its uranium up to 20%. But to stop there is only telling half the story, in my opinion. There is a large amount of circumstantial evidence that casts doubt on Iran's actions. To suggest that I am "convicting an innocent individual before committing a crime" is a poor attempt at a straw man and does not cotton with the contents of my post, actual or implied. The text of the post was to provide background and supporting information to the graphic on the top, which I'm still proud of, that shows how much source material is needed in the whole enrichment process, and also how little work (relatively) is needed to go from 20% enriched to 90% enriched. This is an amazing amount of useful information, than you, Engineer! A point to the poster above: conspiracy to do something is also a crime. In other words, if you plan extensively to kill the President, and they catch you before, then you are not innocent of murder because you haven't done it yet, but you are guilty of conspiracy to kill the President. Engineer - Is it suspected that the Iranians have already exploded a small device in that underground facility? Would IAEA inspection be able to discover this? In other words, is it the final yes or no if they get in.